The debate surrounding this issue is another example of proponents avoiding the salient points. Have you heard? The Electoral College is bad. Elizabeth Warren, Bernie Sanders and others support its abolition. On March 28, Delaware became the thirteenth state to join the National Popular Vote Interstate Compact (NPVIC) in which members agree to award their electoral votes to the candidate who wins the national popular vote. The compact goes into effect only when the combined number of electoral votes of member states reaches 270, assuring their candidate victory. Legislation affixing New Mexico to the NPVIC sits on the desk of Governor Michelle Grisham (D). She's expected to sign it, giving the coalition 189 votes. The debate surrounding this issue is another example of proponents avoiding the salient points. I pose the following four questions to those would undo the electoral college system, with the goal of promoting clarity and focusing on the nub of the matter. If you support the direct democracy of a popular vote system, do you also reject republicanism as our form of government? 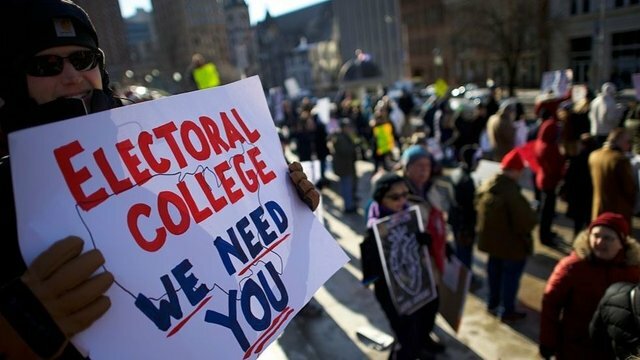 Opponents of the electoral college premise their argument on the claim that the system is undemocratic. This is largely true. In Federalist 10, James Madison wrote of the destructive power of factions, what Tocqueville later called "the tyranny of the majority." For this reason, the Founding Fathers created a republican form of government rather than a direct democracy in order to mitigate the passions and imperfections of the people. Elected representatives would, it was reasoned, take a measured, deliberative approach to governance. A popular vote system, on the other hand, is an instrument of direct democracy and a rejection of republicanism. If, as Madison argued, factions pose such a danger to our republic, and if our Founding Fathers were so leery of direct democracy, what has changed? Ironically, there is no better example of a faction than the states participating in the NPVIC. Madison defined the term as "a number of citizens, whether amounting to a minority or majority of the whole, who are united and actuated by some common impulse of passion, or of interest, adverse to the rights of other citizens, or to the permanent and aggregate interests of the community." Is there any doubt that NPVIC members are motivated in part by a sense of injustice following the elections of 2000 and 2016? Further, given that the NPVIC scheme may award a state's electoral votes to a candidate (the national popular vote winner) who did not carry that state, is there any doubt this scheme operates in a manner adverse to citizens' rights? If you reject the notion of disproportional representation, do you reject the institution of the U.S. Senate? Certain opponents of the electoral college accept the notion of our republican system but take umbrage at the disproportionate representation that contributes to the way in which states' electoral votes are determined. The electoral college allots votes based on the number of a state's federal legislative representatives, meaning the disproportionate representation of the Senate creates a system where certain voters have relatively less or more power than others. Those who oppose the electoral college must therefore also oppose the representative scheme of the Senate and would look to rework or eliminate this institution. It won't do, as some have claimed, to suggest that altering the Senate would be too cumbersome or radical. The design of the electoral college, like that of the Senate, is written into the Constitution; altering either would require a new amendment, or perhaps convening a constitutional convention. If you oppose disproportional representation, it is only logical to oppose it everywhere. Parity between the states was key to ratification. Does parity not matter anymore? Disproportionate representation was part of the Great Compromise of 1787, which established a bicameral legislature to ensure some degree of parity between the states. The House of Representatives, with its proportional representation, was meant to address the people's business, while the Senate's disproportionate representation would ensure states could engage on a level playing field on issues that mattered most to them. The fear that larger states like Pennsylvania, Virginia and Massachusetts would overwhelm the smaller states was palpable. Context here is important. The Articles of Confederation created a weak central government and granted each state a single vote on matters that came before it. Amending the Articles required unanimous consent among the states. When the Constitutional Convention met in Philadelphia to address these shortcomings, smaller states were loath to sign on to an agreement that limited their power against that which might be wielded by larger states. Without the Great Compromise, ratification would never have happened. The issue of parity remains. In the early days of our republic, state population differences were a fraction of what we see today. In a direct democracy system, California, with its nearly 40 million residents, would have more voting power than the 20 least populous states combined. Parity is, by design, key to our federal system. Article 5 of the Constitution notes that "no state, without its consent, shall be deprived of this equal suffrage in the Senate." Without the disproportionate representation of the Senate and the electoral college, states like Vermont and Rhode Island would not have viewed the Constitution as a path toward a more perfect union. Is a popular vote system a cure for the disease? Some of the reasons given for the electoral college have been proven wrong. InFederalist 68, Hamilton envisioned a system that would yield leaders "pre-eminent for ability and virtue." Of course, today's mass media make this a very heavy lift regardless of the system employed. Still, we are the beneficiaries of several of the electoral system's unforeseen advantages. For example, the electoral college system confers legitimacy. Under it there is little chance third- party candidates will succeed, and so the number of contenders for the presidency is limited. By contrast, a popular vote system is likely to attract more candidates, with the winner receiving a mere plurality of votes. In parliamentary systems, it's not uncommon for the winning party to garner a 25% share; such instances are followed by dicey periods of coalition building, where the winning party attempts to cobble together a governing majority … and a patina of legitimacy. Israel's current government is a coalition of five parties that hold 61 of the Knesset's 120 seats. The Likud party, winners of the 2015 legislative election, earned just 23.4% of the vote. Switzerland's coalition government has four parties, Germany's three. The electoral system offers other advantages, such as limiting the incentive for and impact of voter fraud, and encouraging broader campaigns. Despite its shortcomings, the current system has proven effective in surprising ways, and any replacement must at least meet this bar. It's not clear a popular vote system can do so and, indeed, won't be fraught with unforeseen liabilities. At the very least, sober analysis should attempt to ferret these liabilities out. To be sure, states have the power to determine how their electoral votes are apportioned. But the NPVIC goes further. It promotes combination among the states, creating a de facto popular election system that is blatantly anti-constitutional and almost certainly unconstitutional.